Upon completing his sentence at TAHS (with time off for bad behavior), Eric immediately fled to Las Vegas, Nevada and, after a few months living there, fled back to Pittsburgh again. Eric then attended the Community College of Allegheny County and the University of Pittsburgh, graduating in 1982 with no distinction whatever, other than a B.S. in Biology (and he has been B.S.-ing ever since). Because Eric had the foresight to keep the negatives in a safe place, Jeannette Louise Ford was coaxed into marrying Eric in 1983 (a union of the sacred and profane widely viewed as Eric's best decision in life to date). Eric and Jeannette then moved to Athens, Georgia, where Eric pursued (and eventually caught up with) a Master's degree in Zoology at the University of Georgia (a Department that no longer exists). He conducted his thesis research at UGA's Savannah River Ecology Laboratory located on the Department of Energy's Savannah River Site (both of which barely exist). In January 1987, Jeannette and Eric moved to Fort Collins, Colorado, where they learned to live on scenery. Skillfully avoiding the attendant burdens of a well-funded research project and, having cunningly chosen one of the few departments on campus with no teaching assistantships, Eric taught Macintosh continuing education courses and ran a microscopic computer business. This wild success permitted Eric and Jeannette to amass a truly important collection of outstanding bills (many in several editions). The joy of continuing to pay credit card interest for food (long after the carbon contained within it had left their bodies) still generated nostalgic tears in Eric's and Jeannette's eyes for many years afterward. After a long and painful labor, Eric eventually gave birth to a two-pound dissertation in radioecology in the Department of Radiological Health Sciences at Colorado State University in 1993 (a Department that ALSO no longer exists). Eric then spent a month teaching ecology at Taras Shevchenko University in Kiev, Ukraine (which still exists) and then began a three-year research fellowship at SREL. During this time, Eric's research in radioactive environments won him international acclaim (three nations count as "international", right?). After electroconvulsive therapy, Eric no longer flies into a blind rage at the mention of the words "catfish", "DOE", or "Westinghouse". Unfortunately, however, his resulting radiation exposure has not caused him to grow to Godzilla-like proportions, shrink to the subatomic level, or develop spider powers, although he HAS grown stouter, grayer, shorter of breath, goutier, and crankier. 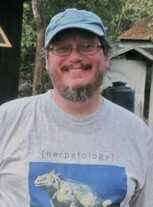 In 1996, Eric became an Assistant Professor of Biological Sciences at Chicago State University, was promoted to Associate Professor in 2001 and to Professor in 2010. Unfortunately, thanks to lack of trustee oversight, a pernicious administration, and lack of funding by the state that threatens CSU with extinction (it also now barely exists), he retired in July 2016. Eric and Jeannette currently reside at Rising Gorge, their baronial shack in Glenwood, Illinois. His mantis-like form in high school has morphed into a close resemblance to an albino manatee. School Story - tell us 1 or more funny, sentimental or other memories about high school years. Luckily, Dr. Novak (who was not as strong in zoology as he was in other areas) gave me the chance to lecture in the final two weeks of our Biology II class, bring in specimens, and even write some of the Final Exam questions (yes, that was me). Also, does anyone remember our alternative publication, "Dragonbreath"? We MIGHT have done two issues. Tell us one fun or interesting fact about yourself and life since high school. Something we can share at the reunion with others. I have seen (Komodo) dragons in the wild. Eric Peters has a birthday today. Eric Peters has left an In Memory comment for Mary Ann Mastriano. The link here is for Tom Morgan. Eric Peters added a comment on his Profile. Eric Peters added a comment on his Profile. New comment added. Eric Peters posted a message. New comment added. Hi, Kate! Are you and Mason coming to the reunion? Eric Peters posted a message. Hope to see you at the reunion! I'll bring the straws! Hi, Bob! Hope to see you at the reunion! Hi, Lisa! Glad you're coming to the picnic. I saw Will at Jeannette's reunion. See you there! I'll bring the sidewinders. Eric Peters updated his profile. View.